Overall 1:64 packs (Hobby only); Least Concern 1:85 packs, Not Threatened 1:562 packs, Vulnerable 1:804 packs, Endangered 1:1,472 packs, Critical 1:2,453 packs, Extinct/Mythical 1:15,947 packs. Click here for our Animal Kingdom Patch Card guide. Sizing: Group A cards - 1.5" x 2.625", Group B cards - 2.5" x 3.5"
2012 Upper Deck Goodwin Champions offers a bit of this and a bit of that. It makes for an eclectic collection of trading cards, autographs, relics, bugs, art and even space debris. 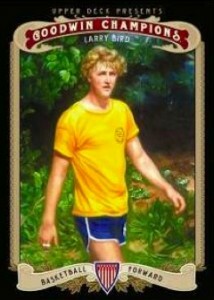 Major and minor sports collide alongside pop culture figures to make up the checklist of 231 total cards including short prints. 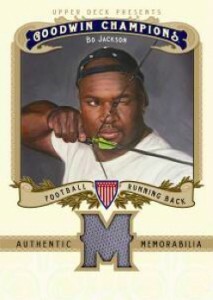 Hobby boxes promise three hits from autographs, relic cards, manufactured patch cards and printing plates. Base set made up of 231 total cards: 150 regular cards, 40 short prints, 20 super short prints and 21 High Series Mini Short Prints. Goodwin Masterpieces 1888 Originals (/10) present hand-panted recreations of the 50 cards from the 1888 Goodwin Champions set. 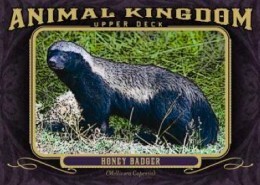 Another 100 cards have been added to the Animal Kingdom Patch Cards set that debuted in 2011 Goodwin Champions. It Came from Outer Space! features relics from meteorites and space debris. 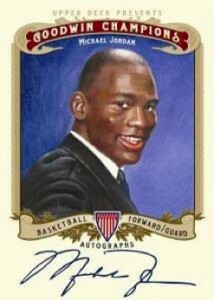 Autographs and Museum Collection Relic Cards return with personalities like Michael Jordan. Entomology Cards embed actual bugs onto cards. Every box has an over-sized World Traveler box topper that measures 5"x7". A short print, mini card or insert is in every pack. I’m a hockey collector but I got hooked on this unusual product with its great variety of cool inserts.The patches are beautiful.The military machines series is a look back at history. The entomology cards are one of those truly unique series you can’t get enough of.Still buying wax boxes were I can find them.Its a thrill to crack open. Great product even though it has been out for 5 years!